Wile away the lazy days of winter, or start a tournament in camp with the Canoe Cribbage Board. Tough Polystone construction will last the test of time. While this cribbage board looks like a canoe, it does not float! 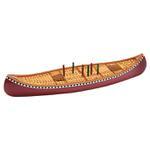 Includes board, playing instructions and 6 pegs that fit conveniently in a compartment with a slide closure. Dimensions: 14" x 3 5/8" x 2 1/4"